Do you buy this critique? Not sure I do. I think this critique is based too much on aesthetics and not enough on moving people. I’m also not convinced that rotaries are “traffic calming”. Certainly most of those installed in Norman have been installed for that stated purpose. I think those fail, too. I think that the design is intended to move people. People may be on foot or on bicycles or in buses or automobiles, and all need to be treated with respect. That said, there are a few things in this image that I don’t care for. 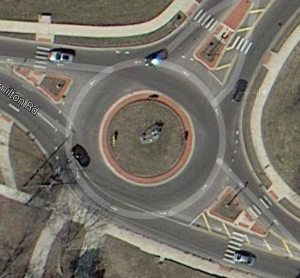 It seems to me that having the auto traffic cross the crosswalks then prepare to enter the circle is not right. Seems to me that the crosswalk ought to be right at the point where the car has to slow anyway. The writers seem to think this is over-engineered. I don’t see that myself. I think, maybe, the engineers were still automobile-centric in their thinking but I don’t see how it’s over-engineered. I like them. If motorists are respectful of people on foot and on bicycles, I think they are much better than an intersection with signals. If motorists aren’t respectful, then I suppose it doesn’t matter what kind of intersection is built.